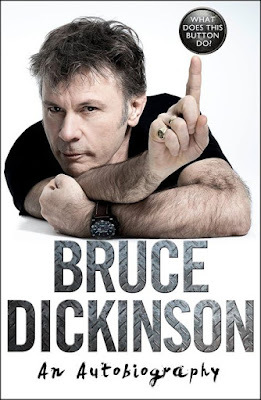 Iron Maiden singer Bruce Dickinson will promote his forthcoming memoir, “What Does This Button Do?”, with a series of book-signing events in both the UK and the US next month. Due October 19 via HarperCollins, the project sees the rocker share – for the first time – details of his years with the band, the early days, his childhood within the eccentric British school system, going solo, realizing his dream of flying jumbo jets and his recent battle with tongue cancer. Billed as “A Conversation With Bruce Dickinson”, the in-store events will feature the singer reading excerpts from the book and discussing it further by answering questions from the audience. In addition to the memoir, Dickinson will issue “Soloworks: The Vinyl Collection”, a box set covering his solo catalogue, on October 27. The package includes the rocker’s six album solo output from 1990 to 2005 reissued via the package and individually on heavyweight, black 180g vinyl. On November 17, Iron Maiden will then release “The Book Of Souls: Live Chapter”, a concert film and audio project recreating the band’s setlist from songs filmed on their 2017 world tour.